You may recall me talking about the California Wine Club before. I received a 2 month subscription to their program back in mid-November and I’m going to be sad when my subscription is over. (Hint: Need a gift idea for me??) My November delivery was from Robledo Family Winery and my December delivery was from Daniel Gehco. Both from California and both were absolutely divine! 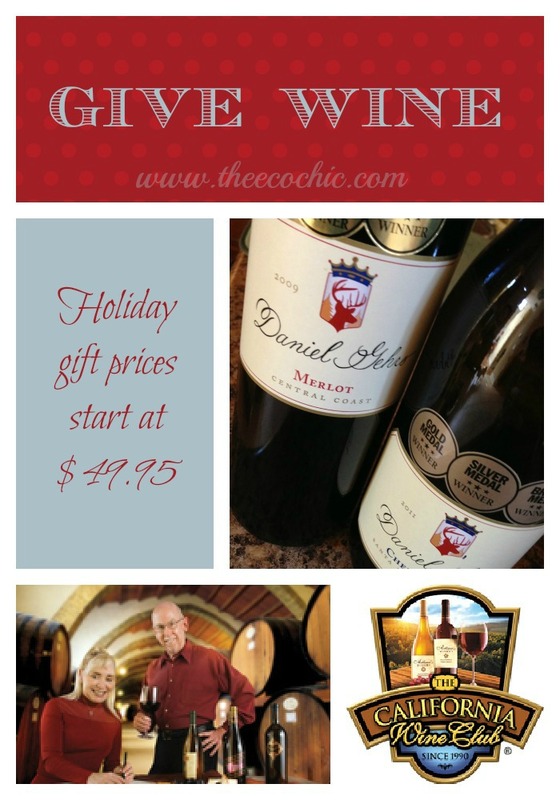 We cheered over the Daniel Gehco Merlot and Chenin Blanc over Thanksgiving with my husbands family. It was a nice addition to our holiday celebration. 2 bottles of wine. You get to choose if they are both white, both red, or one of each. Bonus Gift: a handy wine tote. Bonus Gift: a gift credit for $25 off their next order. I’ve already ordered one gift membership for someone special (can’t tell you who because they read my blog…is it you?) and I’m thinking about who else would like some wine this Christmas? It’s really easy to sign up for the California Wine Club and they ship it for you! Want to win some great prizes from the California Wine Club? To enter visit the California Wine Club Blogger Palooza. Need a Gift Idea? Give a California Wine Club Membership!